Become a Freight Broker or Freight Agent TODAY! With Our Online Freight Broker Training School! As a leader in the online freight broker training industry, Freight Brokers Course.com has developed a Freight Brokerage License school for students to become independent contract agents or freight brokers. You can study anywhere at any time with our cutting edge Learning Management System. Register Today and start learning Instantly! With Packages starting as low as $99, you can learn the skills you need to be successful in the Transportation and Logistics Management as a Freight Broker/Agent with our online freight broker training courses. Licensing to operations, to sales and marketing, you’ll learn the basics of how to run a domestic freight brokerage or agency in the United States. Written by freight brokerage specialists, our Online Freight & Logistics Management Broker/Agent Training Course will provide you with the knowledge and resources needed to build a career. We train agents on industry terms, how to get a freight broker license and the rules and regulations of the industry. Freight broker class training consisting of our Online Freight Broker Training through our cutting-edge Learning Management System. Our Freight Broker License Training Guide was written by members of our load board and a group of experienced freight brokers in the industry, who have a combined total of 15 years of knowledge and experience in the trucking industry. 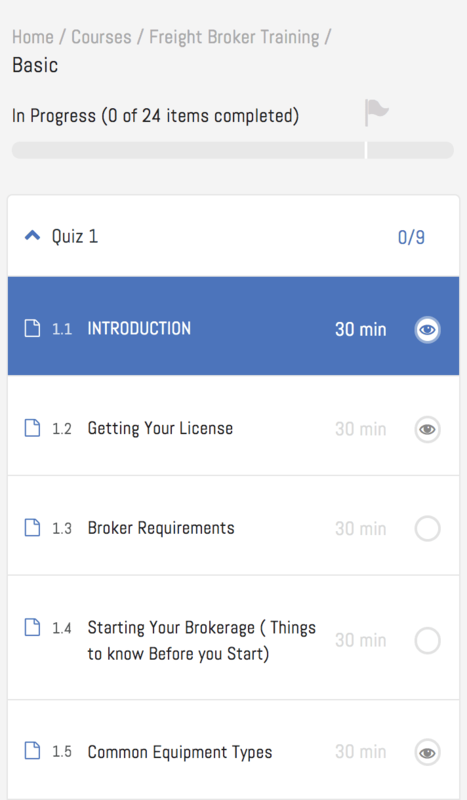 Our training guide provides you with all of the information you need to become a freight broker or an agent as well as the step-by-step process by which to move freight, find drivers as well as how to use the carrier agreement forms provided. You get all of this in one easy, convenient, affordable package! These training modules taught through our learning management system help you manage your time to complete the courses as efficiently as possible. Listed below are topics covered in the Online Freight Broker Training Guide. Become a part of the trucking, freight logistics, and transportation industries as a licensed Freight Broker/Agent. From licensing to operations, to sales and marketing, you’ll learn the basics of how to run a domestic freight brokerage or agency in the United States. Written by freight brokerage specialists, our Freight & Logistics Management Broker/Agent Online Training Course will provide you with the knowledge and resources needed to build a career in this $400 billion-plus shipping industry. There are no specific prerequisites for this program. Because the program focuses solely on U.S. domestic freight brokering, it is recommended for students who are interested in doing business in the United States. Shows you everything you need to keep track of your progress and maximize your training time! Our diverse experience and 24/7 support will help you complete our course at whatever pace you would like and get your business up and running. Join thousands of people starting new careers in the 40 billion dollar freight brokerage industry every day!